VOLANSYS brings you a flawless solar tracker engineered to deliver high-energy annual output & crucial cost savings for ground-mounted solar plants. Out of the two components of sunlight, direct beams carry 80-90% of useful solar energy. Fixed flat-panel are set to collect a high proportion of available noon-time energy, but the same setup becomes ineffective during early morning and late afternoon hours. Significant power available is lost when excessive misalignment with a fixed panel leads to a lower proportion of energy collected, versus available energy. The primary benefit of a tracking system is to collect solar energy for the longest period of the day, and with the most accurate alignment as the Sun’s position shifts with the seasons. Single Axis Tracker [SAT] system increases annual output by approximately 20-40% compared to fixed tilt setup. VOLANSYS’ SAT Controller help in achieving this additional power generation by accurately tracking the Sun’s position. The system is highly configurable and calculates the desired panel position based on defined system parameters. The SAT Controller system also supports effective back-tracking to reduce panel shadow and increase the overall power generation during early morning and late afternoon hours. 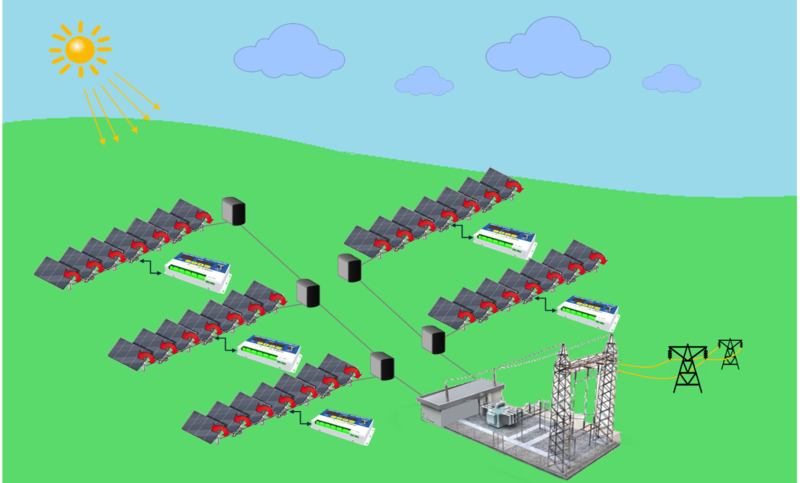 VOLANSYS brings you a flawless solar tracker engineered to deliver high energy annual output & crucial cost savings for ground mounted solar plants. Out of the two components of Sunlight, direct beam carries 90% of the useful solar energy. Fixed flat-panel set to collect a high proportion of available noon-time energy but the same setup becomes ineffective during early morning and late afternoon hours. Significant power available during this time when the misalignment with a fixed panel becomes excessive to collect a reasonable proportion of the available energy. The primary benefit of a tracking system is to collect solar energy for the longest period of the day and with the most accurate alignment as the Sun’s position shifts with the seasons. Single Axis Tracker [SAT] system increases annual output by approximately 30% compared to fixed tilt setup. How can it bring value? How does the SAT Controller work? The SAT Controller is a PID (closed loop) system. The system takes feedback from the tilt sensor and calculates the desired angle based on the sun’s position. It operates a motor to change position from the actual panel angle to the desired panel angle. The system also continuously measures wind direction and velocity and sets the panel to ‘stow’ position if it detects high winds. The SAT Controller can govern motion up to 12 solar tables, each table consisting 75 PV modules with each module capable of generating 150 Watts of power. Thus, a single SAT Controller can control the motion of panels to generate nearly 150 KW of Power. The indigenous Back Tracking Algorithm eliminates panel shadow effects during early morning and late afternoon hours. This feature not only increases power generation during this time, but also increases the efficiency of the photovoltaic panel modules. How does SAT Controller works? The SAT Controller is a PID (closed loop) system. The system takes feedback from the tilt sensor and calculates desired angle based on the Sun position. It operates motor in appropriate direction to actual panel angles inline to desired panel angle. The system also continuously measures the wind and set the panel to stow position if it detects higher wind. SAT Controller can govern the motion up to 12 solar tables, each table consisting 75 PV modules and each module is capable of generating 150 Watts of power. Thus, a single SAT Controller can control the motion of panels generating nearly 150 KW of Power. The indigenously Back Tracking Algorithm eliminates the panel shadow effects during early morning and late afternoon hours. This feature not only increases the power generation during this time but also increases the efficiency of PV panel modules. Want to know more about our SAT controller?